Aim: To evaluate the effects of diagnostic radiation on the epithelial cells of oral mucosa. Objective: To evaluate and compare the possible cellular changes seen in oral epithelium after panoramic and periapical radiography. Materials and Methods: The patients who are advised for panoramic radiography and intraoral periapical radiography (IOPAR) were included in the study with 20 subjects in each group. Smear from the buccal mucosa was taken immediately before and 10 days after the radiation exposure. The cellular changes were studied under the compound microscope. Results: The mean value of micronuclei, condensed chromatin, karyorrhectic cells, pyknotic cells, karyolytic cells, and cells with nuclear bud was found to be increased after IOPAR and panoramic radiographic exposure. Conclusion: The genotoxic effect induced by periapical radiography exposure is more when compared to panoramic radiograph exposure. The cytotoxic effects caused by panoramic radiography on oral epithelial cells are more compared to that of IOPAR. X-rays are potent mutagenic agent. They are capable of inducing both gene mutations and chromosomal aberrations. The damage caused by X-rays can be either direct or indirect. When X-rays act directly on the DNA molecule, it is called as direct damage whereas in indirect damage, X-rays cause damage to the cells by the formation of reactive compounds by interacting with the molecules within the cell. Carcinogenesis is a multistep process that leads to change in morphology and cellular behavior resulting in mutations to genes controlling the cell division, cell death, and DNA repair. X-rays are known to cause DNA damage, by inducing breakage in single- and double-strands. X-rays are widely used for the diagnostic purpose in both medical and dental field. The diagnostic radiation also has some effect on oral tissues. The diagnostic radiation effects depend upon number of factors such as dose, dose - rate, frequency, various host factors such as age, individual susceptibility, type of cell irradiated, type and number of nucleic acid bonds that is broken, the ability of cell to repair the damage. Waingade and Medikeri mentioned about the statement given by Rickes et al. (2010), Jois et al. (2010), and Holland et al. (2008) that the genomic damage are produced by various factors such as genotoxic substances, medical procedures (radiation and chemicals), folic acid deficiency, alcohol, smoking, stress, and drugs, which are grouped under lifestyle factors and genetic factors such as defects in metabolism or in repair of DNA. The cells most commonly used for cytogenic monitoring are human peripheral lymphocytes, but these cells are not considered as appropriate cells for monitoring genotoxic and cytotoxic effects following the radiographic examinations of the oral cavity. The buccal epithelial cells are under direct exposure to dental radiography, and these cells can be easily obtained by just brushing for all these reasons buccal epithelial cells are used as an alternative source for monitoring damage induced by radiographic exposure. This study was done to evaluate the genotoxic and cytotoxic effects following dental radiography which is divided into two categories the intra- and extra-oral radiographic techniques. Among these two techniques, the most frequently used radiographic techniques by the dentist are intraoral periapical radiography (IOPAR) and panoramic radiography. In this study, the genotoxic effects were assessed by micronuclei occurrence, and cytotoxic effects were evaluated based on the pyknosis, condensed chromatin, karyolysis, karyorrhexis, and cells with nuclear bud occurrence., This study will contribute to a better understanding of the outcomes on the cellular system following dental radiography. The study group included forty patients visiting the department of oral medicine and radiology. The patients were divided into two groups. The first group included twenty healthy individuals requiring intraoral periapical radiograph as a part of dental treatment plan. The second group included twenty healthy individuals requiring panoramic radiographic examination as a part of the treatment plan. Exposure parameters used for periapical radiograph were 70 Kv, 8 mA, 0.6-0.8 s, and panoramic radiography was taken using Planmeca Proline, the exposure parameters used in panoramic radiograph were 66 Kv, 6 mA, 18 s. For the patients in the first group, smear for exfoliative cytology was taken just before taking an intraoral periapical radiograph and 10 days later smear was taken from the irradiated and also from unexposed area. For the patients in the second group smear for exfoliative cytology was taken from right buccal mucosa just before taking panoramic radiographic exposure and 10 days after the exposure. The smears were fixed with biofix spray, stained with papanicolaou stain, and mounted with a coverslip using (a mixture of distyrene, a plasticizer, and xylene) mountant. The pre- and post-exposure smear were viewed under compound microscope at ×40. The cellular changes such as micronuclei [Figure 1], condensed chromatin [Figure 2], karyorrhectic cells [Figure 3], pyknotic cells [Figure 4], karyolytic cells [Figure 5], and cells with nuclear bud [Figure 6] were viewed and scored in both the pre- and post-exposure smear under compound microscope. The frequency of these cellular changes was evaluated by scoring 1000 cells on each slide. In IOPAR group, when comparing to pre-exposure, the post-exposure (irradiated area) smears showed an increase in the mean value of micronuclei from 13.2 to 15.45, condensed chromatin increased from 7.15 to 8.35, karyorrhectic cells increased from 2.9 to 3.85, pyknotic cells increased from 10.65 to 12.2, karyolytic cells increased from 5.2 to 6.2 and cells with nuclear bud increased from 6.75 to 7.8. After exposure, the P value for micronuclei was <0.001; this value is statistically significant indicative of genotoxicity. The P value for condensed chromatin was <0.001, karyorrhectic cells were 0.018, pyknotic cells was <0.001, karyolytic cells was 0.003, cells with nuclear bud <0.001; these values were statistically significant indicative of cytotoxicity [Table 1] and [Figure 7]. No statistically significant change was seen in the postexposure unexposed area of IOPAR [Table 2] and [Figure 8]. In IOPAR group, on comparing postexposure irradiated smears with unexposed smears, statistically significant changes were found in irradiated area [Table 3] and [Figure 9]. In panoramic radiography group, when comparing to pre-exposure, the post-exposure smears showed an increase in the mean value of micronuclei from 11.95 to 14.7, condensed chromatin increased from 7.55 to 8.9, karyorrhectic cells increased from 3 to 4.15, pyknotic cells increased from 10.45 to 12.45, karyolytic cells increased from 6.1 to 8.05, cells with nuclear bud from 6.3 to 7.9. After exposure, the P value for micronuclei was <0.001. This value indicates genotoxicity. The P value for condensed chromatin was <0.001, karyorrhectic cells were 0.034, pyknotic cells was <0.001, karyolytic cells was < 0.001, cells with nuclear bud <0.001, these values are statistically significant indicative of cytotoxicity [Table 4] and [Figure 10]. On comparing the postexposure changes among the first and second group, cytotoxic effect was more after panoramic radiography exposure. The mean value of condensed chromatin (P - 0.007) karyolytic cells (P < 0.001) after exposure was significantly higher in patients who underwent panoramic radiography [Table 5] and [Figure 11]. The mean value of micronuclei [Figure 1] after exposure was significantly (P - 0.008) higher in patients who underwent periapical radiography rather than panoramic radiography indicating of more genotoxic effects induced by intraoral periapical radiograph [Table 5] and [Figure 11]. In this study, comparative evaluation of genotoxic and cytotoxic effects of X-ray exposure was done immediately before and on the 10th day after intraoral periapical radiographic and panoramic radiographic exposure. In addition to this, the cellular system changes were assessed in the unexposed area among the patients in the IOPAR group. 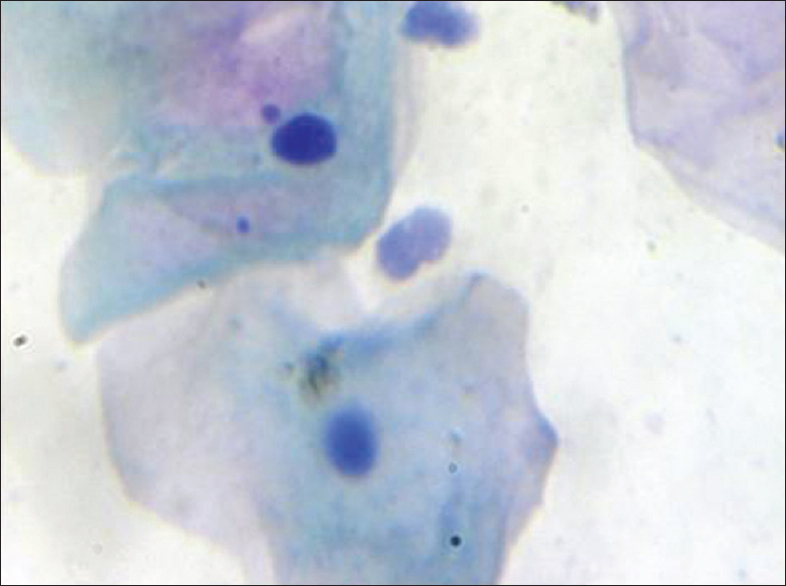 Smear for exfoliative cytology were obtained immediately prior to and 10 days after the diagnostic exposure in both groups. About 10 days interval between the exposures was considered because the epithelial turnover rate takes time (7-16 days) and the nuclear changes are expected at 1-3 weeks after the exposure to a genotoxic agent. To evaluate the magnitude of DNA damage, assessment of micronuclei number is usually done. Angelieri et al. mentioned Belien et al. (1995) statement that micronuclei arise from acentric fragments or from the whole chromosomes which are not included into the main nuclei of the daughter cells. The formation of micronuclei can be induced either by clastogens (substances that cause chromosome breakage) or by aneugens (agents that affect the spindle apparatus). To evaluate the cytotoxic effect, the nuclear changes such as condensed chromatin, karyorrhectic cells, pyknotic cells, karyolytic cells, and cells with nuclear bud numbers are assessed. In the present study, we found a statistically significant increase in the mean value of micronuclei after exposure to panoramic radiography and these findings were fully in line with those of Cerqueira et al., Waingade and Medikeri, and Arora et al. The studies by Pai et al., Popova et al., and Madhavan et al. found overall increase in mean micronuclei number after exposure to panoramic radiography but the increase in number was statistically insignificant. Other studies conducted by Ribeiro et al., Angelieri et al., and Ribeiro showed no alteration in frequency of micronuclei after radiographic exposure. On comparing the pre-and post-exposure cellular changes after periapical radiography exposure, we again found a statistically significant increase in the mean value of micronuclei. In this study, comparative evaluation of genotoxicity induced by periapical and panoramic radiography exposure was done. The mean value of micronuclei after exposure was significantly (P - 0.008) higher in patients who underwent periapical radiography rather than panoramic radiography indicating of more genotoxic effects induced by intraoral periapical radiograph. After panoramic radiograph exposure, we found a statistically significant increase in the mean value of condensed chromatin, karyorrhectic cells, pyknotic cells, karyolitic cells, and cells with nuclear bud. These findings were similar to studies performed by Madhavan et al., Ribeiro, Ribeiro et al., Angelieri et al., Pai et al. In contrast to these result, in a study conducted by Cerqueira et al. showed no statistically significant increase in pyknosis, karyolysis, and broken egg before and after exposure to panoramic radiography. After periapical radiograph exposure, our study showed a statistically significant increase in the mean value of condensed chromatin, karyorrhectic cells, pyknotic cells, karyolytic cells, and cells with nuclear bud. These results were in line with Diba et al. who studied the frequency of number of karyorrhexis in patients who underwent repeated periapical or panoramic radiography. Increase in frequency of other nuclear alterations such as condensed chromatin, karyorrhectic cells, pyknotic cells, karyolysis, and cells with nuclear bud are suggestive of cytotoxic effects. On comparing cytotoxic effects induced by panoramic and periapical radiography, statistically significant increase in the mean value of condensed chromatin cells [Figure 2] and karyolytic cells [Figure 5] was found after panoramic exposure. This study will contribute to a better understanding of radiation-induced changes seen on the oral mucosa after diagnostic radiography. Increase in number of micronuclei, condensed chromatin, karyorrhectic cells, pyknotic cells, karyolytic cells, and cells with nuclear bud are seen in both of the dental radiographic techniques. The genotoxic effect induced by periapical radiography is more compared to panoramic radiograph exposure. The cytotoxic effect caused by panoramic radiography on the oral epithelial cells is more compared to that of periapical radiography. Since genotoxic and cytotoxic effects have been shown to be induced following diagnostic radiography, all safety measures are to be effectively applied during these procedures. Madhavan R, Kumaraswamy M, Kailasam S, Kumar SM. Genetic damage in exfoliated cells from oral mucosa of individuals exposed to x-rays after panoramic radiograph. J Indian Acad Oral Med Radiol 2012;24:102-5. Arora P, Devi P, Wazir SS. Evaluation of genotoxicity in patients subjected to panoramic radiography by micronucleus assay on epithelial cells of the oral mucosa. J Dent (Tehran) 2014;11:47-55. Ribeiro DA, de Oliveira G, de Castro G, Angelieri F. Cytogenetic biomonitoring in patients exposed to dental x-rays: Comparison between adults and children. Dentomaxillofac Radiol 2008;37:404-7. Whaites E. The biological effects and risks associated with X-rays. Essentials of Dental Radiography and Radiology. 3 rd ed. London: Elsevier Science; 2002. p. 30, 75, 161. Waingade M, Medikeri RS. Analysis of micronuclei in buccal epithelial cells in patients subjected to panoramic radiography. Indian J Dent Res 2012;23:574-8. Popova L, Kishkilova D, Hadjidekova VB, Hristova RP, Atanasova P, Hadjidekova VV, et al. Micronucleus test in buccal epithelium cells from patients subjected to panoramic radiography. Dentomaxillofac Radiol 2007;36:168-71. Diba SF, Mudjosemedi M, Shantiningsih RR. The number of karyorrhexis in patients undergoing repeated periapical or panoramic radiography. Proceeding of the international symposium on oral and dental sciences. Indones J Dent Res 2014:183-7. Angelieri F, Carlin V, Saez DM, Pozzi R, Riberio DA. Mutagenicity and cytotoxicity assessment in patients undergoing orthodontic radiographs. Dentomaxillofac Radiol 2010;39:437-40. Pai A, Sharma RC, Naik RM, Guruprasad Y. Biomonitoring of genotoxic and cytotoxic effects of gingival epithelial cells exposed to digital panoramic radiography. J Orofac Sci 2012;4:124-8. Ribeiro DA. Cytogenetic biomonitoring in oral mucosa cells following dental x-ray. Dentomaxillofac Radiol 2012;41:181-4. Cerqueira EM, Meireles JR, Lopes MA, Junqueira VC, Gomes-Filho IS, Trindade S, et al. Genotoxic effects of x-rays on keratinized mucosa cells during panoramic dental radiography. Dentomaxillofac Radiol 2008;37:398-403.